Illustrates the former Washington City Canal - now under Constitution Avenue. This is an 1845 Henry Schenck Tanner map of Washington, D.C. published by Edward L. Carey and Abraham Hart. 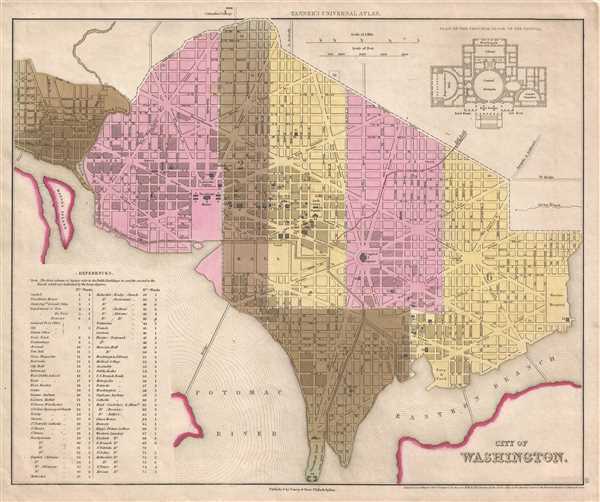 The map depicts the city from Georgetown and the Potomac River to the Marine Hospital and the Anacostia River and from George Washington University (then known as Columbian College) to Greenleaf Point and the confluence of the Anacostia (Eastern Branch) and Potomac Rivers. The Washington City Canal, which operated from 1815 until the mid-1850s, is illustrated here, connecting the Anacostia River and the Chesapeake and Ohio Canal. The Canal, as it was known in D.C., which ran along the north side of the National Mall, fell into disuse in the later 19th century and was either covered over or filled in in 1871. Constitution Avenue was built on top of the filled in Canal. Highly detailed, every street in the city is labeled, along with several squares. Seventy-five different buildings around Washington, D.C. are illustrated and labeled numerically, with the numbers corresponding to a table situated in the lower left corner. Some of these buildings include the Capitol building, the White House, the Departments of State, War, Navy, and the Treasury (all of which are located right next to the White House) numerous churches, and the insane asylum. City wards are numbered and shaded different colors to allow for easy differentiation. A floor plan of the principal (ground) floor of the Capitol Building is situated in the upper right corner and labels the Representatives Hall, the Central Rotunda, and the Senate Chamber.